The Perfect Running Shoe for you! For years I only worked out and ran in Adidas running shoes. They are the perfect running shoe! I loved Adidas shoes, but needed to see what else was out there. Was this really the best running shoe? I didn’t want to buy another running shoe, but then I got to thinking. Should I branch out? Try a new running shoe? Breakup with my Adidas? Everyone will tell you that the shoes they wear are the best, that their running shoes are better than yours. So I tried some ‘recommended’ shoes. But when I started running outside every day, about five years ago, my feet really started to ache! Why were they aching so bad? Running shouldn’t hurt my feet like this! I quickly realized it was my running shoes. I had branched out from Adidas, tried a different shoe, and now my feet were super sore! I decided that I was going to go back to Adidas. I was going back to the perfect running shoe. I discovered Adidas Clima Cool after saying no more to hurt feet, and my world was forever changed! From the moment I started running in these shoes, I never wanted to stop. To this day, my feet have never felt sore like they once did. These shoes have cushioned soles and are designed for the track and city streets, like my home in Los Angeles. They are wicked light weight and come in lots of cool designs. I’ve owned a myriad of colors and variations of Clima Cool over the last five years, but my favorites are what’s pictured above. The blessing and the curse of the run: the more you run the faster your shoes wear out. No sweat! I never bought into the hoopla of having a fancy running shoe. Some people swear a $200 pair of running shoes is what you need. People! Trust me. That is not what you need! All you need is YOUR pair of perfect running shoes. That’s what Adidas Clima Cool is and they don’t cost a fortune. The shoe has perfect support! The light weight sole makes it feel like you’re running on air. The shoe promotes itself to be worn in the warm climates, but I’ve worn it in all sorts of climates from the East to the West coasts, and I find it to work in both. But if I lived in a cold weather climate all year round, I would definitely look into the Adidas Clima Heat running shoes for the winter. Did I mention that the colors available in these running shoes are awesome? I love that they have bright options. My current shoe is a bright orange/pink color! I love putting those bad boys on in the morning and running in the dark with them. So much fun! 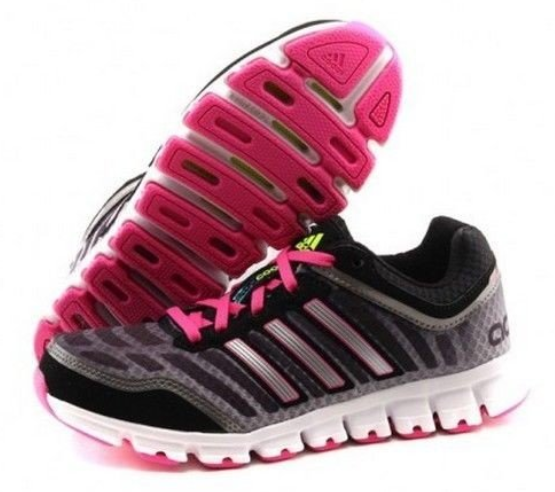 Adidas Clima Cool are fashionable and functional. Hot damn! How can you go wrong with this shoe? Don’t let the search for the perfect running shoe drag on. Adidas Clima Cool are right there waiting for you! Your feet won’t ever be sore again! Previous PostPrevious Recipes. Recipes. And more Recipes! Next PostNext Jump Rope Workout – Get to Jumping!